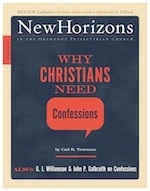 Despite claims to the contrary, the Christian world is not divided between those who have creeds and confessions and those who just have the Bible. It is actually divided between those who have creeds and confessions and write them down in a public form, open to public scrutiny and correction, and those who have them and do not write them down. The reason is simple: every church (and indeed every Christian) believes the Bible means something, and what it thinks the Bible means is its creed and confession, whether it chooses to write its beliefs down or not. When the editor of New Horizons invited me to write this article, I knew I had to do it. Why? Because of what the Westminster Standards did for me. So let me tell you my story. Where is the Orthodox Presbyterian Church going? Where has it been? Where should it be? If these questions are answered correctly, the responses to them will be the same. Let’s have a look.